So far my time working at Fairfax Media AU has been pretty much non-stop from day one – whilst the media companies are often thought of as dull and slow moving, the reality is that companies like Fairfax are huge and include a massive range of digital properties and are not afraid to invest in new technologies where there are clear business advantages. It’s great stuff for me, since I’m working with a really skilled group of people and being given some awesome and challenging projects to keep me occupied. Since January I’ve been working with the development team to build up the infrastructure needed to run the servers for our new paywall initiative. It’s been a really fun experience working with a group of skilled and forwards thinking group of developers and being able to build infrastructure that is visible by millions of people and at such a key stage in the media business is a very rare opportunity. Our new paywall has just been launched a few days ago on Sydney Morning Hearld and The Age websites for select international countries (including the US and UK) before we roll it out world wide later in the year. 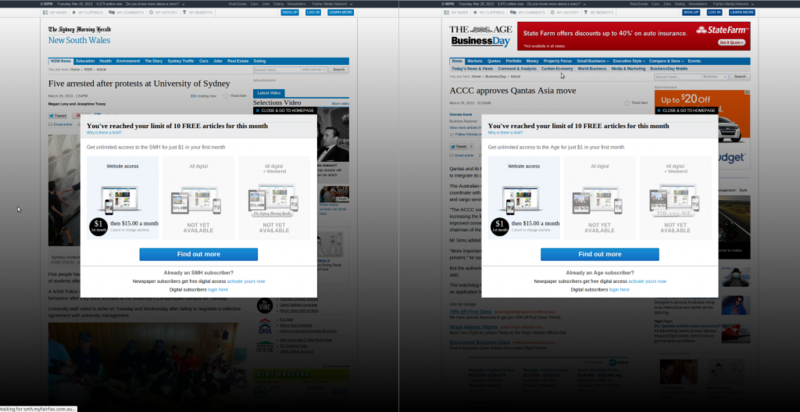 Paywalls on SMH and The Age, as seen for select international countries. Mobile hasn’t been neglected, a well polished interface has been provided there too. Obviously paywalls are a pretty controversial topic, there’s already heaps of debate online ranging from acceptance to outright rage for the idea of having to pay for daily news content and plenty of reflection over long term sustainability of Fairfax itself. I won’t go into too much detail, I have somewhat mixed personal views on the idea, but generally I think Fairfax has created a pretty good trade off between making content casually available and sharable. Rather than a complete block, the paywall is porus and allows a select number of article reads a month, along with liberal social media sharing and reading of links shared by others. Changing a business model is always hard and there will be those whom are both happy and unhappy with the change, time will tell how well it works. Thankfully my job is about designing and managing the best infrastructure to run the vision that comes down from management rather than trying to see into the future of the consumption and payment of media content, which has got to the be the hardest job around right now…. Whatever your format of choice, we have your fix! It’s been an interesting project working with a mix of technologies including both conventional and cloud based virtualisation methods and using tools such as Puppet for fast deployment and expansions of the environment, along with documenting and ensuring it’s an easy environment to support for the future engineers who operate it. 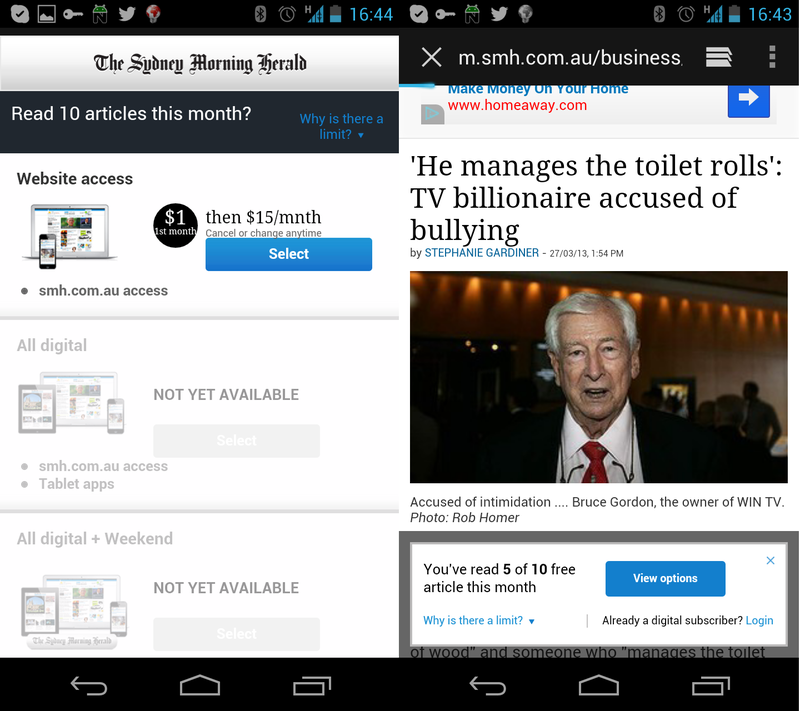 This entry was posted in Uncategorized and tagged australia, fairfax, geek, journalism, opinions, paywall, smh, theage. Bookmark the permalink.